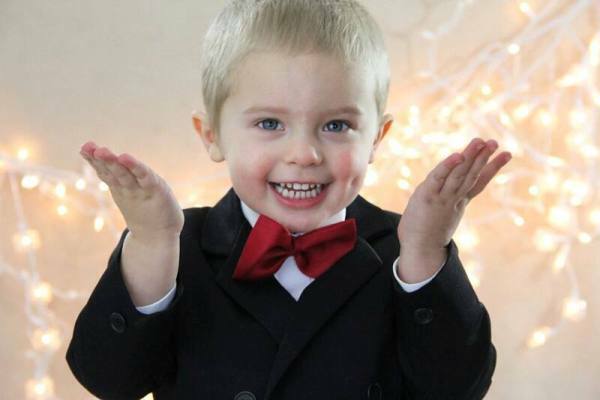 James Dias is only 3 years old and has already had 5 surgeries. To say thanks for the great care he received, James’ mother has signed up to be a Change Bandit to raise money for the “Have a Heart, Do Your Part” radiothon, which airs Feb. 13-15 on 98.1 WKDD. James started vomiting when he was 1 week old. We started formula changes, and the vomiting continued to get worse. Dr. John Fyda ordered an upper GI and found that James was born with a rare condition called intestinal malrotation, which means his intestines did not attach to his stomach wall during gestation. We then met Dr. Pittinger. James had his first surgeries, an appendectomy and a Ladds procedure, at 6 weeks old. Dr. Pittinger is the most caring and gentle surgeon we have ever met. Since then, James has had 5 surgeries on his belly, and they found out he has a disease called gastroparesis, which means the stomach muscles that contract the food to be digested are paralyzed. James has been in feeding therapy and is getting better week by week. James is such a fighter, and he is the most incredible kid. He has bounced back and overcome so much in his short 3 years. I am very proud to be James’ mom. All I can say is that he is amazing and such a miracle. I truly admire his strength. Click here to support the “Have a Heart, Do Your Part” radiothon. What an amazing little guy!! Way to go James! !